Turning eight is GREAT, and Marisol McDonald wants to plan a party that will be fabulous, marvelous, and divine! 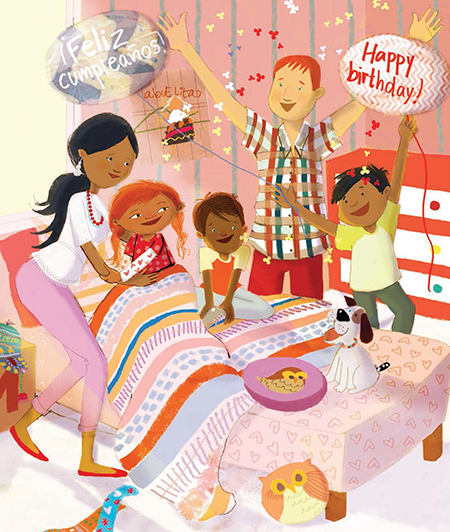 Marisol McDonald and the Clash Bash/Marisol McDonald y la fiesta sin igual takes readers on a whirlwind trip as Marisol plans for her eighth birthday. With her bright red hair, golden brown skin, mismatched outfits, and endearing individuality, all this free-spirited Peruvian-Scottish-American girl wants is the greatest "clash bash" ever! There are so many choices, but everything in the store matches! Nothing seems right for soccer, pirate, princess, unicorn-loving Marisol. Finally she comes up with just the right idea, and when her friends arrive for her Clash Bash birthday, a big surprise awaits. But in a heartwarming turn of events, Marisol gets the biggest surprise of all—a visit from Abuelita via computer. 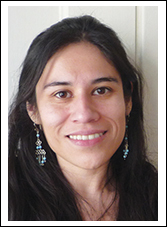 In this BookTalk, author Monica Brown and illustrator Sara Palacios share their thoughts and inspirations on creating a bicultural character and why they love being a part of children's books. How did you originally become interested in writing children’s books? Monica Brown: Well, first of all, I really love young children and not just their sweetness. I really admire the way young minds work—their capacity for imagination and joy and most importantly their sense of wonder and delight. I want to nurture and encourage that with my stories. I started writing after I had children of my own and they were picture-book age. I began with biographies when I looked around and couldn’t find the stories I wanted my daughters to read, the people I wanted them to know—Gabriela Mistral, Celia Cruz, Dolores Huerta, Gabriel Garcia Marquez, to name a few. Do you have a favorite part of the publication process? MB: I love every part (hmmm, revisions not so much), but a particular pleasure is when I see the final art for the first time. It’s always a delightful surprise to see what another creative person has done with my words. I like the fact that my words spark images and art that didn’t exist in the world before. My other favorite part is when I first start sharing the book with large groups of children. You’ve spoken about how the Marisol books are inspired by your own Peruvian-American heritage. Were there any scenes or moments in Marisol McDonald and the Clash Bash inspired by a particular anecdote from your own childhood? MB: Ninety percent of the book is inspired by my own childhood! I had many interesting, and sometimes painful, experiences growing up as the child of a South American mother and a North American father, and when I had my own children I began to think about how to tell the story of a little girl who is unique and sweet and who defies any attempts to limit her expression of self . . . and that is how Marisol McDonald was born! 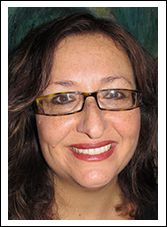 Adriana Dominguez does the Spanish translations for the Marisol books and you speak both English and Spanish so you can understand her translation. Did the way Adriana translated your words ever surprise you, or make you think differently about either English or Spanish? MB: Translation is always an interesting process, since I speak Spanish, but it is not my native language. Adriana and I are friends, as well as colleagues and we have collaborated in numerous capacities, so our lines of communication are very open. We most often agree, sometimes disagree, but our conversations (or debates!) result, I think, in beautiful, dynamic translations of my work. I am lucky to work with such a knowledgeable translator. Do you have any advice for young people growing up today in bicultural households, who may feel torn between cultures? MB: I would tell them to embrace the complexity and beauty of their experiences, their many cultures. I would encourage them to not let others define them as “less than” or “half of” or in any way less “authentic.” Racial categories and blood quantum are tools of the colonizers, we would do best to reject them completely. I think the “tearing” between two cultures often come from outside forces, because our multicultural familes have come together with love. There have been several articles in the last few years lamenting the lack of Latino books for children. You’ve been working to change that in several ways—not only through your books but through your involvement with L4LL. Do you feel that things are improving? 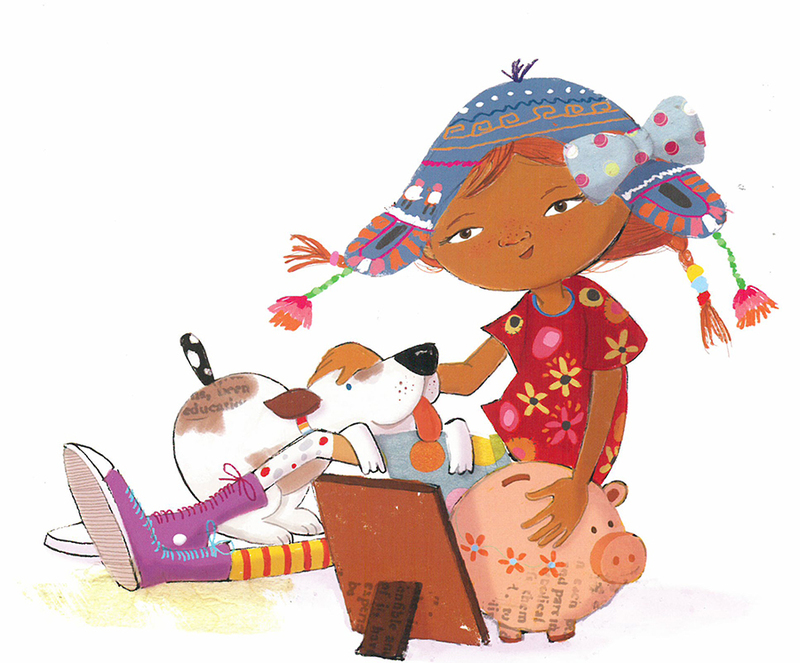 What can readers do to encourage more Latino books for children? MB: I do feel that there are gatekeepers out there that have narrow views about what “minority” books should entail and who their audience is. 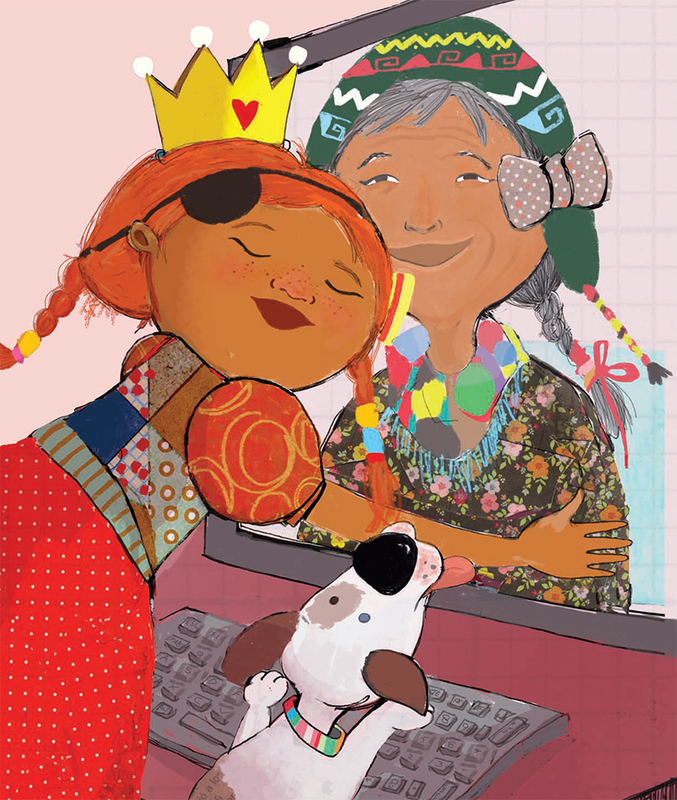 I think we need to start by supporting the many amazing Latino/a authored and illustrated works that are out there, and not marginalize them in our book reviews, on bookshelves, at major conferences. We also need editors and editorial boards who are willing to buck “trends” and take risks. Luckily there are some of those folks out there, most especially at Lee and Low! I don’t think folks realize how precious and important it is to have a press like Lee and Low still taking risks, still making the space for new and brilliant voices, and still surviving and thriving. I don’t think people realize how many independent presses have closed doors in the last five years. 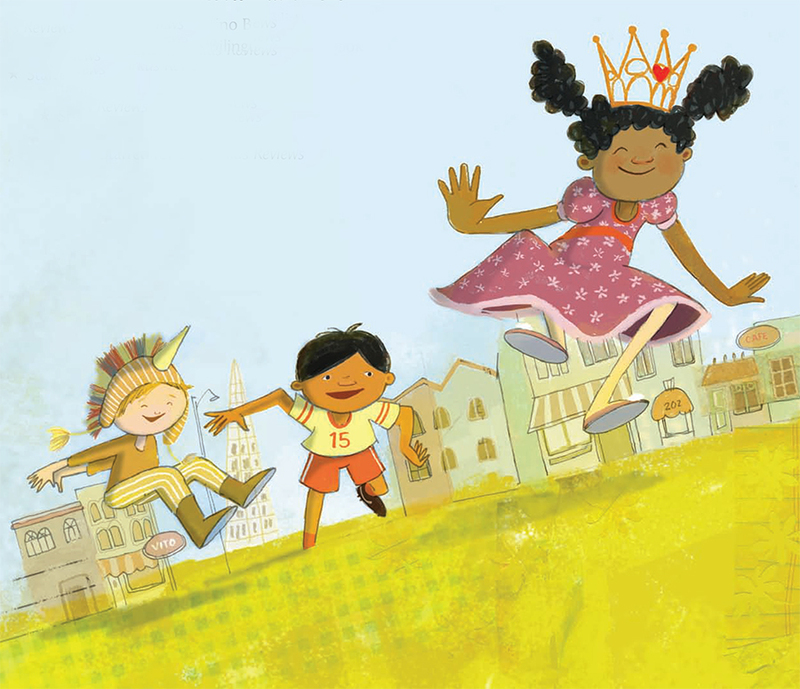 What materials did you use to illustrate Marisol McDonald and the Clash Bash? Sara Palacios: I always use mixed media in my work. For Marisol's illustrations I transferred the drawings to the paper, then I used ink to do the line work. I pasted pieces of cut paper to create the textures in the background. I added some of the colors with markers or color pencils or gouache, and I finish the whole illustration in the computer. Which scene in Marisol McDonald and the Clash Bash was your favorite to draw? SP: Well, I honestly enjoyed drawing all of them. I don't know if I have a favorite, but I really enjoyed drawing the new character: the abuelita. I was given Monica Brown's picture of her grandmother, that made drawing this character challenging and special. Also I think more than one favorite scene, my favorite part is coming up with new outfits for Marisol. What was the most challenging thing about illustrating this book? SP: Drawing Marisol again. She is so unique that it becomes very important to reflect her personality in every drawing, in every outfit! It was important for me being able to keep her as fresh and as unique as in the first book, I hope I succeeded. I think drawing a sequel of a book is challenging because you want to keep the characters as true to themselves and as charming as they were in the first book.